Six artists whose critically acclaimed works span a wide spectrum from illustration and painting to digital, sculpture, installation and mixed media will discuss their artistic philosophies and creative process during the Western Connecticut State University spring semester Master of Fine Arts lecture series continuing from Feb. 5 through April 24. All lectures, sponsored by the WCSU Department of Art M.F.A. in Visual Arts program, will be in Room 144 of the Visual and Performing Arts Center on the WCSU Westside campus, 43 Lake Ave. Extension in Danbury. Admission will be free and the public is invited; advance registration is requested at www.wcsuvpac.eventbrite.com. The series will begin at 11:30 a.m. on Tuesday, Feb. 5, with a lecture by Nancy Stahl, whose works in both traditional media and digital creative platforms during a career stretching over nearly five decades earned her election in 2012 to the Society of Illustrators Hall of Fame. A native of New York who attended the Art Center College of Design in Los Angeles, Stahl initially worked in gouache and developed a signature poster style of illustration during the 1970s. Her introduction during the late 1980s to digital image creation on early platforms including Quantel Paintbox and Adobe Photoshop inspired her to transition exclusively to computer-generated art work over the past three decades. 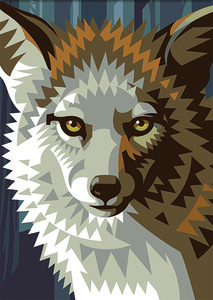 Stahl’s illustrations have become widely recognized internationally through her editorial work for many publications including the New York Times, the Wall Street Journal and Time magazine, as well as through her corporate branding and advertising work for many clients including the Disney Family Museum, the National Parks Service, Stonyfield Farms and the Metropolitan Museum of Art Costume Institute. The U.S. Postal Service has featured more than 35 Stahl illustrations on postage stamp issues. Her works have been shown in many solo and group exhibitions in the United States and abroad, and have been included in several major anthologies of contemporary illustration. Stahl is an art instructor at the University of Hartford and has taught at Syracuse University, the School of Visual Arts and the Fashion Institute of Technology. Tuesday, Feb. 19, at 11:30 a.m.: Hilary Doyle works in diverse media including painting, drawing, printmaking and sculpture to explore myriad aspects of class, gender and the human psyche. A native of Worcester, Massachusetts, who now resides in Brooklyn, Doyle received her M.F.A. in Painting from the Rhode Island School of Design and has shown her works in 45 solo and group exhibitions since 2007 across the United States and in England, most recently at the Saatchi Gallery in London and at Field Projects in New York. She has held artist residencies at the Massachusetts Museum of Contemporary Art and the Vermont Studio Center and has curated exhibitions at RISD and at New York galleries including Projekt722, where she served for three years as co-director. In an artist statement about her creative process, Doyle explained that many of her works begin with “mundane moments observed” that inspire exploration of “the rituals and emotions of daily life. People reveal their disposition in their folded arms, baby carts, laughing eyes, tightly clutched bags or work uniforms. These clues spark imaginary narratives about people’s lives in each work.” Doyle also is an art educator who founded and co-directs the NYC Crit Club and who has taught drawing, painting and foundation classes at RISD, SUNY Purchase College and Brown University. Tuesday, March 5, at 11:30 a.m.: Ross MacDonald, who now resides in Connecticut, learned his illustration, graphic design and printmaking craft on the job at several small printing and publishing houses in his native Canada before embarking in the United States on a career that has popularized his works in magazines, newspapers, movies, TV shows, comics and children’s literature. His illustrations have appeared in scores of publications including Vanity Fair, Harper’s, The New Yorker and Rolling Stone, and his children’s books “Another Perfect Day” and “Achoo! Bang! Crash! The Noisy Alphabet” have earned Publisher’s Weekly, Child Magazine and Nick Jr. Best Book awards. His professional honors include a retrospective show at the New York Times and recognitions for artistic excellence from the Society of Illustrators, American Illustration, the Society of Publication Designers and Communication Arts. His skill with letterpress and drawing in re-creating retro-styled illustrations has earned steady work to create period “graphics props” for many TV series including “In Treatment” and “Boardwalk Empire” and movies such as “Silver Linings Playbook,” “Seabiscuit,” “National Treasure 2: Book of Secrets” and Quentin Tarantino’s “Hateful Eight.” He also has created animated shorts for “Sesame Street” and “Saturday Night Live” as well as cards for MOMA and a postage stamp design. Tuesday, March 19, at 11:30 a.m.: Leslie Cober-Gentry an adjunct professor of art at WCSU and adjunct instructor at the Fashion Institute of Technology, has created illustrations for approximately 50 publishing and corporate clients ranging from the Washington Post, Reader’s Digest and National Geographic to Sony Records, Disney, “Sesame Street,” Nike and Microsoft. Cober-Gentry observed on her website that she strives through illustration and design to meet each client’s goals, striving “to make sure that each component of the project is attended to with every possible effort, passion and dedication.” Daughter of Alan Cober, whose legendary career was celebrated with his induction into the Society of Illustrators Hall of Fame, Cober-Gentry published her first work in the New York Times at age 15 and has gained critical praise for her elegant and uplifting designs. Recipient of an M.F.A. from the University of Hartford, she has garnered numerous honors including recognitions from the Society of Publication Designs and Graphic Design USA and citations in the Print Regional Design Annual and Vision Awards Annual Report competitions. She serves as a member of the Society of Illustrators executive board, the Fairfield Theatre Company board of directors and the New Britain Museum of American Art’s Sanford B. Low Illustration Collection Committee. She also curates the annual Members Show at the Museum of American Illustration of the Society of Illustrators. Monday, April 1, at 11 a.m.: Fritz Drury, professor of illustration and faculty member at RISD since 1981, focuses at his Brooklyn studio on figurative oil paintings that evoke a poetic narrative derived from literature, art history and contemporary experience. The artist notes on his website observed that he explores “themes with extended socio-political significance” in works such as his recent painting “Rumpelstiltskin,” which suggests an ideal state of human connection with the natural universe and considers the role that the painter plays as a mediator between the individual and the world. Drury, who holds an M.F.A. from the Yale School of Art, has exhibited widely across the United States including shows at the Painting Center and the National Academy of Design in New York. As a portrait painter, he has created commissioned works for collections at Brown University, Colorado College, the University of Rhode Island and other institutions. He is co-author of the textbook, “Drawing: Structure and Vision.” Recipient of the John R. Frazier Award for Excellence in Teaching at RISD, he also has taught a collaborative course at Brown in virtual reality design for science. Wednesday, April 24, at 11 a.m.: Kenny Rivero draws deeply from his childhood roots in the Washington Heights neighborhood in upper Manhattan to create a diversity of painting, drawing, sculpture and installation works. “My work addresses themes of Dominican-American identity, socio-geographic solidarity, cultural and familial expectations, race and masculinity,” Rivero explained. “I produce work that offers viewers a chance to reflect on hope, loss and memory.” Recipient of an M.F.A. from the Yale School of Art, he has presented eight solo exhibitions and three solo installation projects and has participated in more than 55 group exhibitions across the United States as well as Italy, Spain, Japan, the Netherlands, Iran and Turkey. He has held a visiting scholar position in the Steinhardt School at New York University and artist residencies at the Skowhegan School of Painting and Sculpture, Mana Contemporary, the Fountainhead, the Roswell AIR Foundation and the Lower Manhattan Cultural Council Workspace Program. Other honors include the Rema Hort Mann Foundation Emerging Artist Grant, the Robert Schoelkopf Memorial Travel Grant and the Doonesbury Award. Rivero has taught painting, drawing and sculpture at many institutions including Yale, the Metropolitan Museum of Art, the School of Visual Arts, Montclair State University and the Massachusetts College of Art and Design.